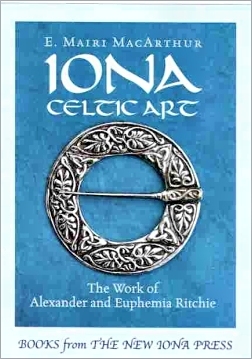 A fine new book by E.Mairi MacArthur entitled ‘Iona Celtic Art, The Work of Alexander and Euphemia Ritchie’, is now in print (2003) through the New Iona Press. The book contains a comprehensive history of their life and work, and is available worldwide through www.amazon.co.uk or direct through Iona Press. The pictures are superb, and the book is a must for any enthusiast of the Celtic Crafts revival and the work of this remarkable couple. EVENTS - The book was launched at a signing on 25th March 2003, at Royal Mile Curios in the heart of Edinburgh, where Roy Eprile and his staff have been enthusiastic promoters of Ritchie work for many years. Shortbread and tea were dispensed throughout the afternoon to all who dropped in for a book or a blether or both. From 8th-10th August, a superb display of over 100 Ritchie items was on show at the Scottish Art and Antiques Centre, thanks to Fiona MacSporran and Gordon Foster of decorative arts@doune. A large gathering of collectors, dealers and folk with an Iona link attended the preview, which included a short talk about the Ritchies. ŒFascinating and ŒA unique show - excellent!¹ were among the guest-book comments. In October, during the National Mod in Oban, information was on display about the Ritchies, drawing particular attention to the two magnificent silver shields they designed for An Comunn Gaidhealach in the 1930s. Both were won, once again, by youth choirs from Argyll. And on 4th March, Dingwall Library invited me to give a talk about Iona Celtic Art for World Book Day. 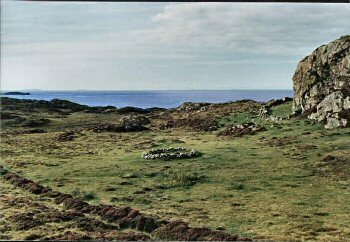 From 20th March until 19th June 2004, a major exhibition is being staged by The City Art Centre in Edinburgh: IONA Island of Inspiration. Along with paintings by many of the artists associated with the island, there are rare books, manuscripts, archive photographs & postcards and souvenirs - and a case of Ritchie silver and brass, along with a few items by Iain MacCormick and embroidery by Hannah MacCormick. The gallery, just behind Waverley Station, is open Mon-Sat, 10am-5pm, admission free - do go if you can! SALES - The book has sold steadily, mostly from local outlets in Iona and Mull and by mail order. In theory any bookshop anywhere can order it for a customer, either from me as the publisher or through the distributor Book Source in Glasgow, but occasionally large chainstores are reluctant to order just a single copy. Let me know if you have problems. Some of the best outlets are not bookshops at all, eg: Royal Mile Curios, High Street, Edinburgh; Scottish Art & Antiques Centre, by Doune; The Iona Shop, Oban; Green Kite Fair Trading, Strathpeffer; Mull Museum, Tobermory; Salen Silver, Mull; High St Gallery, Kirkcudbright. Steve Walker sells the book on my behalf in North America (see above, www.celtarts.com). The Heritage Centre on Iona has a permanent information display about the Ritchies and their work, as well selling the book. It was also on sale at the Edinburgh International Book Festival in August and on display on the Scottish Publishers Association stand at the Scottish International Trade Fair in Glasgow in January. Again, any ideas for appropriate outlets would be very welcome - places to do with silversmithing, design or Arts & Crafts might be interested. Trade discount is offered and stock can be supplied sale or return. * Duncan Ritchie, Carradale, kindly drew my attention to a newspaper cutting which recalled the wedding of Lady Jean Crichton-Stuart, Isle of Bute, in May 1922. All the girls of Bute also named Jean presented the bride with a silver box, Celtic cross and chain, all Œdesigned by Mr Ritchie, Iona. The report added that Œthe workmanship is exceptionally beautiful. The archivist at Mount Stuart has no record of the items but is making further enquiries within the family. * Thanks to Christine Ritchie - and to a gap during a London Gaelic Choir practice, when she could dart upstairs! - I have finally seen a photograph of the fine plaque in Crown Court Church, London, which Alec Ritchie designed in memory of Lady Victoria Campbell. * From information about the trademark and size of the stamp box on the postcard reproduced on p.69, Bob Abel has managed to narrow down the date of printing to early-mid 1920s. This in turn helps to place the Ritchie designs illustrated on the card to before that time. * Collectors of Keswick metalware have come across a round brass planter more likely to be a Ritchie: continuous rolling vine pattern; made in 2 pieces with rolled edges; base edged and beautifully soldered into place; feet attached with solder; 4.5² high, 7.75² diameter. Does anyone have a similar piece? After seeing the book, other readers realised that their brass mirror is a Ritchie (as in plate 3a - three of these now known to exist). They also have a pair of shield-shaped copper bookends, each with a galley in full sail within a circle - no mark but clearly a gift, as on the back of one is engraved: ŒKay Young from the Committee of the Girls Association, 7th May 1938¹. Does anyone know who this was and if there was an Iona link? * A book went to an Oban lady now living in Canada, where a good friend of hers turns out to be a grand-daughter of Mr Darby from the Birmingham firm who were linked with the Ritchies for so long. * Deirdre McDonald has reminded me that, as well as copying the mediaeval spoon and the hair fillet excavated from the Nunnery (p.50), Ritchie also made a replica of the gold Œrope ring in the same find. It was commissioned in 1932 by Charles Cammell, author of Heart of Scotland (1956), for his wife. ŒI just wish my mother could have seen this book. It would have been a great delight to her. She had met Uncle Alec on several occasions and had quite a collection of brooches and other items and often used to talk about him and Aunt Effie - and I always had the feeling that she thought they had not received due recognition - and I am sure there were others in the family who felt the same.... now, 60 years later that has been remedied. I'm always pleased to receive information, pictures or queries about the Ritchies or their work. This year's mail order leaflet, slightly revised, is enclosed to pass on to anyone who may be interested. Many thanks.